NIMASA trains 59 seafaring cadets at UK university – Royal Times of Nigeria. 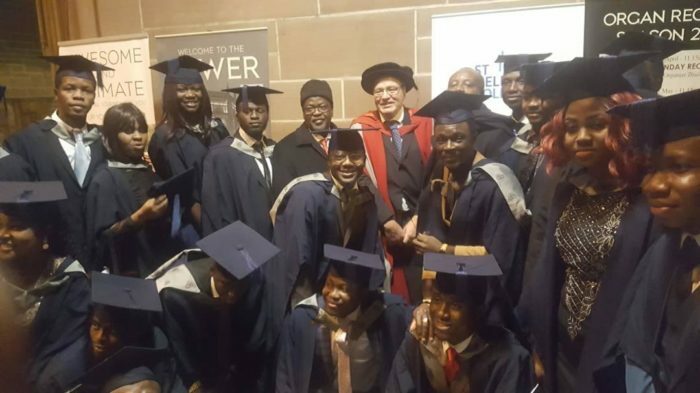 The Nigerian Seafarers Development Programme (NSDP) has produced another 59 cadets, who graduated from the Liverpool John Moores University, United Kingdom. According to a statement by NIMASA Head of Corporate Communications, Mr Isichei Osamgbi in Lagos on Thursday, 1,343 graduates have been produced by the scheme since its inception. The graduates were produced from institutions in UK, Egypt, Romania and Philippines. “At the graduation ceremony held in the UK recently, four of the students graduated with First Class, while 36 of them had Second Class (Division 1) degrees while others graduated with various grades,” the statement read. Deputy Director, Maritime Labour Services of the Nigerian Maritime Administration and Safety Agency (NIMASA) and Coordinator of the Nigerian Seafarers Development Programme (NSDP) initiative of the Agency, Mr. Victor Egejuru in a photograph with some of the beneficiaries of the NSDP scheme during their graduation ceremony from the Liverpool John Moores University, UK recently. The Director-General of NIMASA, Dr Dakuku Peterside, described the graduands as the future of the Nigerian maritime industry. He spoke of plans to ensure they do their mandatory sea time training, to become qualified seafarers. The director-general, who was represented by the Agency’s Executive Director, Maritime Labour and Cabotage Services, Mr Ahmed Gambo, implored the students to continue to be good ambassadors of Nigeria. He said they would be expected back home to take over the Nigerian maritime space. “Let me congratulate you on this great feat of your graduation from this prestigious University. means the maritime industry can survive and compete favourably with its counterparts globally. professionals in the maritime sector both in Nigeria and internationally, ” Peterside said. So far, about 2,000 Nigerian youths have been beneficiaries of the NIMASA NSDP scheme. The programme was conceived to bridge the manpower gap of the seafaring profession in Nigeria.